When a signal is received the motor opens up the hydraulic circuit, and the rider has .5 seconds to position the seat where they'd like before the circuit is closed. Battery life is said to be at least 400 cycles, or somewhere around one month of riding. If the handlebar remote battery dies it's still possible to raise or lower the post by pushing the same button that's used to check the rechargeable battery level, and even if the battery in the post dies there should still be enough juice saved to raise or lower the seat once or twice in order to finish a ride. The Vyron is without a doubt the easiest to install dropper post on the market. There's no need to fuss with running housing through a frame, tiny pinch bolts, or anything more complicated than plugging a charger into a wall. Instead, once a CR2032 battery is installed in the remote, and the post has been charged and inflated, all that's left is to insert the post into the frame, securing the remote to the handlebar with a rubber o-ring, and that's it. It's a simple as can be – even someone who struggles with fixing a flat tire shouldn't have any trouble getting the Vyron up and running. It's worth noting that the Vyron's seat clamp mechanism is offset forward by a few millimeters – you may need to slide your seat back a little bit from its typical position to accommodate.Once it's installed, there's a tiny on / off switch hidden behind a rubber cover on the post, which is also where the micro USB charging port is located. Pushing on the remote will wake it up, and a green light flashes to indicate that it's communicating with the post. The Vyron doesn't behave exactly like a 'normal' dropper post. On most droppers you push a remote lever of some sort, lower the seat to where you want it with your body weight, and then release the lever to lock it in place. That's not the case with Vyron. Instead, you push and release the remote button, and then there's a .5 second window to lower the seat. What if you push the button, weight the seat, and then unweight it in less than .5 seconds? That's right, it starts to raise back up, which is my biggest gripe with the Vyron. It's simply not as easy or as intuitive to use as a 'standard' dropper post, especially if you're riding somewhere with terrain that requires raising and lowering your seat more than a couple times. Ideally, the post's mechanism would open when you pushed a button, and close when you released it, but that's not what happens with the current configuration. Imagine being in a race scenario where you've raised your seat to quickly grind up a hill, and then need to drop it out of the way as soon as possible on the other side. With the Vyron, you need to spend extra time weighting the seat at the bottom of the post's travel in order to ensure that it's going to stay put when you stand up. Now, half a second may not seem like that much, but it feels like a lot longer out on the trail. I adjusted my technique a little bit to accommodate the way the Vyron works, but it was still never as simple as using a conventional dropper, and I had a number of instances where I thought I'd waited long enough, and then realized I hadn't as I dropped into a steep line with my seatpost partially extended. The remote works, and it's easy to locate without the need to look down, but I would have liked to see something more refined, something a little less plasticy and not held on by a rubber o-ring. The fact that the Vyron is electronic and wireless should open up all sorts of design potential – imagine a small push button integrated into the edge of a lock-on grip, or even a shifter style lever that just doesn't have any cable and housing attached to it. 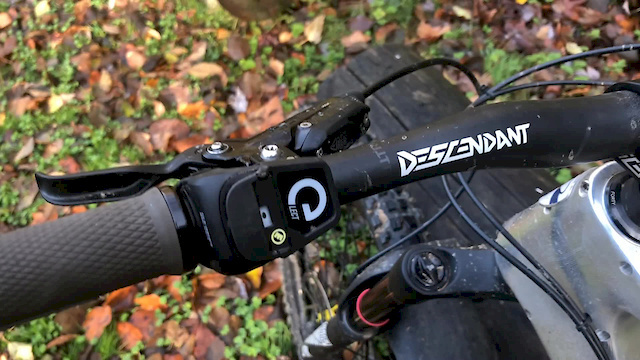 Instead, the remote seems like it was an afterthought, and it doesn't hold a candle to the numerous well-designed options that are available for non-wireless dropper posts. It's not that Magura have made a faulty product, it's that I don't think they took the concept far enough. The post itself is well made, holds a charge for an impressively long time, and it does work as intended, albeit with a few performance quirks. I could even see it as being a useful component for a shop to have on hand in order to loan out to a dropper-curious customer. However, there are currently several simple, reliable, and much more affordable cable-actuated posts on the market that perform better than the Vyron. Four years of soul-searching boosted Intense’s market share and ushered in their Rider Direct sales program, but at what cost?